No more cuts - Develop Europe’s long-distance rail! Trains can create the best and most environmentally friendly connections across Europe. But a wave of closures of long-distance rail services has swept through our continent. We are facing an important Climate Summit later this year and this is the time to get back-on-track! The Back on Track coalition will take your opinion to the rail companies and to EU with some more practical proposals. Have a look and see what we will do with your support. 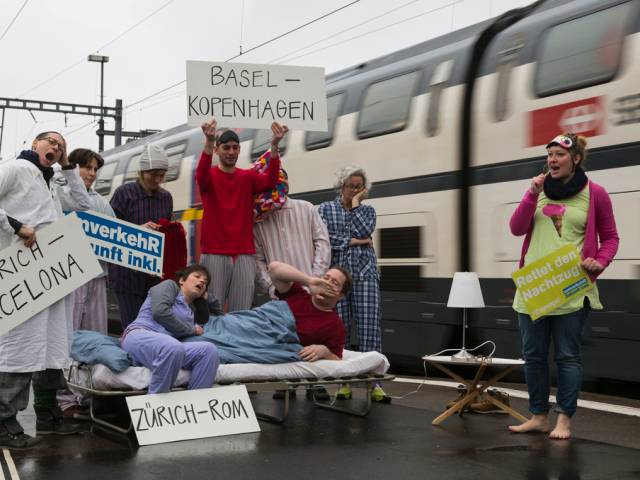 Activists on the platforms in Zürich to protest against reduction of night trains. Similar actions are planned Europe-wide on the 20.6. Back on Track is a European network to support improved European cross-border passenger train traffic.